Father of teenage Jewish girl shot and killed in high school shooting sues gunman and deputy who remained outside during shooting. JTA- The father of Meadow Pollack, one of the 17 students and teachers killed in the shooting at a Parkland, Florida, high school in February, has filed a wrongful death lawsuit against the gunman as well as those it alleges failed to stop him, including a deputy who stayed outside the building. Andrew Pollack filed the lawsuit Monday in Broward County Circuit Court. He told the Sun-Sentinel newspaper that he was not interested in any monetary reward he would get from the lawsuit. Peterson resigned 10 days after the Feb. 14 shooting at Marjory Stoneman Douglas High after 33 years in law enforcement. Video footage showed that he never entered the building during the attack by Nikolas Cruz, 19, a former student there. Peterson had been the resource officer at the school since 2009. 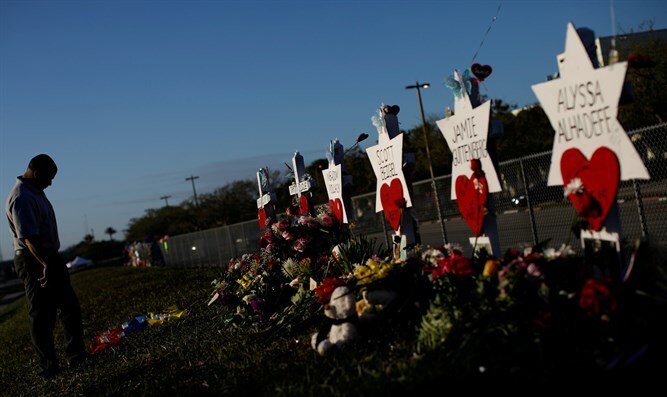 The lawsuit also names the estate of Lynda Cruz, the shooter’s mother, who died in November; three mental or behavioral health centers, who are accused of failing to provide Nikolas Cruz proper treatment; and James and Kimberly Snead, who allowed Cruz to live with them after his mother died and who, according to the lawsuit, did not properly secure the shooter’s firearms. Meadow Pollack was 18 and a senior at the high school when she was killed. Pollack gained notice in the days after the shooting by attending what was billed as a listening session at the White House with President Donald Trump.